Straight forward roadside birding, beautiful scenery and amazing local culture; and a ton of endemics! Javan Plover, Brown Goshawk; Spotted Harrier; Short-toed Snake-Eagle; Sumba Buttonquail; Red-naped Fruit Dove; Sumba Green-Pigeon; Orange-crested (Yellow-crested) Cockatoo; Marigold (Rainbow) Lorikeet, Great-billed Parrot, Eclectus Parrot, Red-cheeked Parrot, Great Sumba Boobook; Little Sumba Boobook (Hawk-Owl); (Australian) Barn Owl, Mees’s Nightjar; Cinnamon-banded Kingfisher; Tenggara (Glossy) Swiftlet, Sumba Hornbill; Elegant Pitta; Wallacean Cuckooshrike; Pale-shouldered Cicardabird, Sumba Brown Flycatcher; Sumba Flycatcher; Sumba Warbling Flycatcher (Russet-backed Jungle Flycatcher), Sumba Spangled (Wallacean) Drongo; Chestnut-backed Thrush; Sumba (Red-headed) Myzomela; Indonesian Honeyeater, Apricot-breasted Sunbird; Sumba (Blood-breasted) Flowerpecker; Golden (Rusty-breasted) Whistler, Wallacean (Spectacled) Monarch. 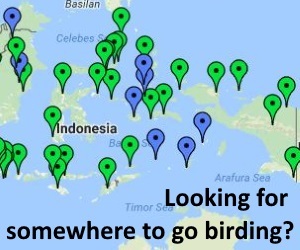 Sumba has a lot of birds packed into a small number of sites! 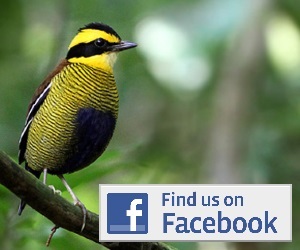 All but one of the endemics are found in forest, and if you are lucky you can see them all in 1-2 days. Sumba Buttonquail is the only endemic which cannot be found in the forest, and is most often searched for near either one of Sumba’s two airports. The most commonly visited site is Yumbu, around 20 km east of Waingapu. Take a car or ojek (motorbike taxi) along the coast road until an obvious bridge over a wooded ravine is reached. The fields on either side of the bridge, and on either side of the road hold Sumba Buttonquail, but seeing them is not always so easy, and probably will require lots of marching around in the hope of flushing one. Heading past the Buttonquail site at Yumbu the coastal road goes past a wetland site that holds a number of more widespread wetland species, and exploring the area is likely to add a number of waterfowl to your trip. An alternative for Sumba Buttonquail, if you arrive or leave from Sumba’s other airport, Tambolaka, is to head north from the airport towards the coast, then east along tracks towards the Newa Sumba Resort. Sumba Buttonquail have been seen in the fields and grassy scrub near the resort. Be careful identifying buttonquails, as both sites also hold Brown Quail, and both Red-backed and Barred Buttonquail are recorded on Sumba! The scrubby coastal strip can also be productive for other species, including Spotted Harrier, Brown Goshawk, Barred Dove, Australian Bushlark, Green Junglefowl, Indonesian Honeyeater, Apricot-breasted Sunbird and Sumba Brown Flycatcher. A population of Tailorbirds has recently been discovered by Craig Robson/Birdquest, to the north west of Waingapu on Londa Liwa beach. These Tailorbirds are very similar to Javan (Olive-backed) Tailorbird, the nearest species geographically speaking, but no-one knows how they have got here, how long they have been here, or whether they are just an introduced population of Javan Tailorbird. The site can be reached via private charter Ojek, minibus or taxi from central Waingapu, and heading north west on the coast road for about 8km until you reach a former airstrip. The beaches round here also hold Javan Plover. The small village of Lewa lies in the centre of Sumba on the main east-west road, around one hours drive from Waingapu, or around two hours drive from Tambolaka. It is famous for being close to some nice forest, and for having a couple of guesthouses that can help arrange transport, guides and logistics (see details below). Around Lewa there are several good spots for birding, any one of which can get you all the endemics if you are lucky. The four most birded sites are; a patch of degraded forest east of Liwa at KM51 on the road, a stretch of Manupeu-Tanah Daru National Park c10km west of Liwa at KM68-72; an area of Manupeu-Tanah Daru NP c20km south of Liwa near the village of Watumabela; and a stretch of Manupeu-Tanah Daru NP about 30km west of Liwa at KM93-98. The KM51 patches of forest to the east of Lewa have proved very productive for birding over the years. These forest patches have the distinct ‘advantage’ (from a budget birding perspective!) of not lying within the national park. This means you can avoid any kind of forced formality in visiting them (see below!). Access is from a side trail heading south from the main road around 10 km west of Lewa (at about the km 51 marker). Following this side track brings you to the patches of forest after only a short walk, and then the birding is similar to the forests west of Lewa; with recent information suggesting the site is still a good location for Sumba Green Pigeon, along with many of the other endemics, including the night birds. It is probably less reliable now for Sumba Hornbill and Orange-crested Cockatoo. In fact given the additional edge and disturbed habitats, the passerine endemics can seem more accessible here than in the more pristine stretches of forest in the National Park. To the west of Lewa lies Manupeu-Tanah Daru National Park, the biggest national park on the island (the other national park is Laiwangi-Wanggameti in the south-east of the island). The edge of the park begins around 10 km to the west of Lewa. Here the main road drops down through 2-3 km of nice forest situated between km markers 68-72. Birding is excellent along this road in the early morning, and all of the forest endemics can be seen here on a good day, plus non-endemic goodies like Elegant Pitta and Chestnut-backed Thrush. Simply get a ride from Lewa and get dropped at the top or bottom and work your way slowly along the road, exploring any side trails that look interesting. The site is reliable for night birds, with both endemic Boobooks present in the forest, and Mees’s Nightjar. Orange-crested Cockatoo is no longer regularly seen along this stretch of the road, and Sumba Hornbill may also have declined here. To the south of Lewa, also within Manupeu-Tanah Daru National Park, is another forest site, near the village of Watumabela. The village is around 20 km south of Lewa and is best reached by car or a long motorbike ride from Lewa. From the village trails head west towards the park and forest. Most birders head to a hill-top viewing site about an hours walk away in the hope of picking up pigeons and Orange-crested Cockatoo, the specialities of this site. Finding the right trail to this observation hill is not so easy, so you will probably need to take a local guide. Early morning is best, meaning it is likely that the drive and the walk will both be in semi-darkness. During the wet season the trails may become overgrown and difficult to negotiate. The section of the cross-island road between around km markers 93-98 is the other main accessible birding site. This area can either be accessed from Lewa (about 40 mins drive) or from the town of Waikabubak further to the west (about 20 mins drive). The road goes through around 4-5 km of good condition forest, and in several places provides excellent views over the forested valley below. This area lies at the western boundary of Manupeu-Tanah Daru National Park and holds all of the forest endemics. The views over the valley, particularly at the eastern edge from a small trail leading to a view point at KM88 provides an excellent look-out for Sumba Hornbill, pigeons and parrots, including Orange-crested Cockatoo, and small groups of this highly threatened species can still be seen over the forest here. The areas at the bottom of the road, near the metal bridge that forms the western boundary of the park, holds the endemic owls and Mees’s Nightjar. Lewa itself is set in farmland, with rice paddies and secondary vegetation. Munias flocks can include Pale-headed and Five-coloured Munias, and Barn Owl is regularly seen in the wider local area. Sumba has two airports, both served by flights from Denpasar, Bali, with fluctuating schedules to other airports in the Lesser Sundas (Kupang, Bima, etc). Most birders opt to fly to Waingapu, the bigger of the two (but that is not saying it is big! ), and then base themselves initially in Waingapu town where there are several hotels (look in Lonely Planet for examples). For those arriving at Tambulaka airport in the west, the nicest accommodation option is the nearby Newa Sumba Resort (www.newasumbaresort.com), which also has excellent birding in its grounds. From Waingapu to get to Yumbu for the buttonquail you can simply hire a car (from your hotel), a taxi (if you can find one) or an ojek (motorbike taxi). To get to Lewa or Waikabubak from either Waingapu or Tambulaka you can seek out public buses (ask at your hotel for where to find one) or rent a car for the trip (again your hotel will be able to arrange this). In Waikabubak there are several basic hotels. In Lewa, historically the place to aim for is the homestay (losmen) run by Kathy & Cornelis Hary (Jl. Pameti Karata, Lewa, Sumba, 87152). To contact Hary’s Losmen, call Mamma Rewu on +6285239910745 or email another guy in the village named Budi at b_Karwelo@yahoo.de and he can apparently pass a message on. Other options are however available, including Jonny’s Homestay, a basic homestay on the main road of Lewa. To get to the sites around Lewa, ask for help at your homestay, who should be able to arrange an ojek or car to get you to any of the sites. To get to places from Waikabubak you can get a car from your hotel and head east towards the forest, or negotiate any other form of transport that suits your budget (bus, bike etc!). As several of the sites mentioned above are within the National Park, you do technically need permission from the park to go birdwatching there. This includes birding along the busy main road… Provision of a park guide may or may not also be mandatory. There are several possibilities for how you deal with this. We make no recommendation here, as everyone seems to have a different experience, these are just your options! Let your homestay/accommodation in Lewa sort you out (in advance, if you can). They will know the latest situation with the park and can help you arrange whatever formalities are prevailing. This may or may not involve you taking a guide from the park, and may or may not involve you paying variable amounts of money to them. There is also a local guide, Freddy Hambuwali who apparently knows the Sumba sites and can help you with arrangements (freddy_ikat@yahoo.com) or alternatively use one of the ‘Indonesia-wide’ local guides/agents or tour companies to take the pain out of the logistics! Present yourself to the park, and negotiate. The head office of the park is in Kupang (very useful..). There is also supposedly a section office in Lewa, and possibly also Waingapu and Waikabubak. If you can find any one of these, turn up and say what you want, and the park will start quoting prices. The mandatory requirement is that you get an entrance ticket, but the official price is only a few dollars for a few days. There is also a mandatory small extra charge if you have a camera. This said, don’t expect to be quoted the mandatory charge, and the park can (by law) at their discretion require you to be accompanied by a guide, for which there is no set charge. The good news (!) is that you are more than free to haggle. If you don’t like what they quote you first, offer far less and try and agree on something acceptable. If you finally cant agree on a price or ‘service’, then walk away, revert to option 1 above, or concentrate on the forest outside of the park!